This link (via Gayle D.) is pure awesome. Turns out someone has decided to offer prescription drugs via an ATM. For policy wonks, this has all the hallmarks of a disruptive innovation. I suspect that in the pharmaceutical industry the 80/20 rule is in effect. That being 80% of patients are using only 20% of the available drugs. So a small number of drugs account for the vast majority of all prescriptions filled. That means you could service a huge part of the market with only a handful of drugs on hand. This is precisely what this ATM for drugs allows you to do. Moreover, it allows you to do it faster, cheaper and with a better experience for customers. That is precisely what a disruptive innovation is. Indeed, you can see the early signs of its disruptive nature in the way it is being talked about. Some pharmacists will undoubtedly feel threatened by the technology, says Jeff Poston, executive director of the Canadian Pharmacists’ Association. But he predicts the machines will have only a niche role, likely in remote communities that have limited pharmacy services, since the devices offer patients a “lesser” form of communication with the druggist. “I tend to think the face-to-face encounter with the pharmacist would win hands down,” he said. Niche role? I suppose, if you count 80% of the pharmacy business as niche. I suspect this service will take off – and we’ll need fewer pharmacists. On the flip side, the pharmacists we keep will have to very good since they’ll be focused on the more dangerous, complicated and difficult prescriptions – which really is the best use of their time. What about people’s alleged preference for face-to-face encounters? Perhaps this is a preference. But how strong is that preference? For me, it isn’t so strong that I’m willing to hang around in the pharmacy for 30 minutes while my prescription is being filled, or worse, to come back they next day. I suspect that the overwhelming majority of us will use the ATMs – just like we do at the bank. Just over 800 patients used the machines at Sunnybrook to obtain 1,200 prescriptions between June and September. A survey of 108 of them indicated that more than 95% received their drug in less than five minutes and would use PharmaTrust again, said Peter Suma, president of PCA. None of the prescriptions was incorrectly filled, he said. Not everyone, however, was able to take advantage of the pharmaceutical ATMs. About a third of patients who tried discovered that their medicine was not available, said Dr. Domb, though PCA offers to deliver those orders to the patient’s home the next day. 95% satisfaction rate? This technology is killer. And check out the different perspectives of the two quotes. This entry was posted in random and tagged canadian pharmacists association, disruptive innovation, druggist, health, healthcare, innovation, pharmacy business, prescription drugs, random, technology on March 23, 2009 by David Eaves. 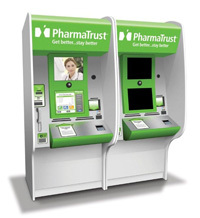 Perhaps pharmacists will become information workers vs. dispensers. The value they add is the targetted advice based on experience. More often than not, I've seen them consult a book anyways, for reference – an activity that a database application could do in seconds. I suggest the pharmacist still adds value but in a slightly different role. I look forward to the ubiquity of this technology so I'm not caught in the drugstore for 30 minutes with an impatient child while I wait for my drugs to be dispensed. I've written about this in the past in consultation with major US pharmacy chains. My assertion was exactly what you've written about above: a relatively small collection of drugs account for a vast majority of prescriptions. Simplifying the prescription process is one advantage, and one of the other advantages is that if all prescriptions are tracked by software, the system will immediately pick up drug interactions. Then, you pick up the little phone on the machine and have an immediate conversation with someone to resolve it. And, if you complete other information (such as diet, allergies, etc. ), the vending machines might also note suggest generics that you could discuss with your health provider, or point out that the latest batch of your prescription includes a soy-based fixer and isn't suitable for you any longer because of your allergy, etc. Of course there are privacy concerns that need to be addressed, but those should not distract us from moving forward. This is very similar, in principle, to other healthcare innovations in recent years. For example, Minute Clinics in the US skim of the high volume of simple cases (e.g., colds, flu shots) and get them looked after in minutes. Independent Sector Treatment Centres in the UK do the same with the “simpler” knee and hip replacements, leaving the more complex cases to the NHS (ISTCs are licensed by the Dept of Health). This strikes me as the same concept. It's great for people with simple conditions that require regular displacement (e.g., contraception), but we still need to make sure there's someone or some process to help navigate the more complex (read: and more expensive) cases. There's also the question of what PharmaTrust will do with the patient information. I'm also watching Shoppers Drug Mart for the same reason. Like Google and the telcos (Bell and Telus have both made investments in healthcare information), there are a lot more entrants into the healthcare space than most Canadians realize.